Learning objectives: Prevalence, phenotype and diagnosis criteria of major syndromes predisposing to colorectal cancer and the genes implicated. Familial adenomatous polyposis, Lynch syndrome, MUTYH associated polyposis. Dr Lefèvre is Professor of General Surgery in the Department of Digestive Surgery, Saint-Antoine Hospital in Paris. 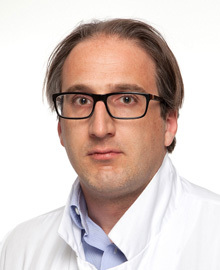 He specialises in colorectal surgery (colorectal cancer, IBD, familial cancer, redosurgery after failed anastomosis). He has published more than 110 articles in peer-reviewed journal. He is a member of ESCP, AFC, SNFCP, GRECCAR and SFCD. Desurmont T, Lefevre JH, Colas C, Shields C, Tiret E, Parc Y. Desmoid tumors in familial adenomatous polyposis patients: Responses to treatment. Fam Cancer 2015. 14(1):31-39. Lefrancois M, Lefevre JH, Chafai N, Pitel S, Kerger L, Agostini J, Canard G, Tiret E. Management of acute appendicitis in ambulatory surgery. Is it possible? How to select patients? Ann Surg 2015. 261(6):1167-1172.